In 2014, Martin launched a high-profile campaign on Prizeo to raise funds for two charities: Wild Spirit Wolf Sanctuary and the Food Depot of Santa Fe. As part of the campaign, Martin offered one donor the chance to accompany him on a trip to the wolf sanctuary, including a helicopter ride and dinner. 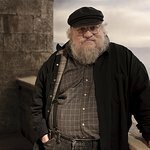 Martin also offered those donating $20,000 or more the opportunity to have a character named after them in an upcoming A Song Of Ice And Fire novel and “killed off”. The campaign garnered significant media attention and raised a total of $502,549. Google trends for "George R.R. Martin"